← Can I sleep 8 more minutes? Dinner and a movie – for the first time in years! 7:10 Woke up after 6,5 hours of sleep. Today my daughter had a day off from school so we took our time this morning. We also spent some time packing an overnight bag for my daughter. 9:10 Breakfast with my daughter. 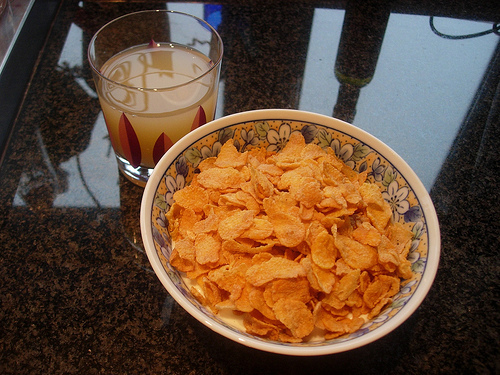 Yoghurt, banana, cinnamon and corn flakes with a glass of apple juice. 9:40 Cycled to the train station (2.58 km) and took a train to where my parents in law live. When we got there my mother in law was waiting for us. We walked to their house and after a cup of tea I left. I took the train back to where I live and ran some errands and talked on the phone with two of my friends. 12:40 Cycled home (2.59 km). 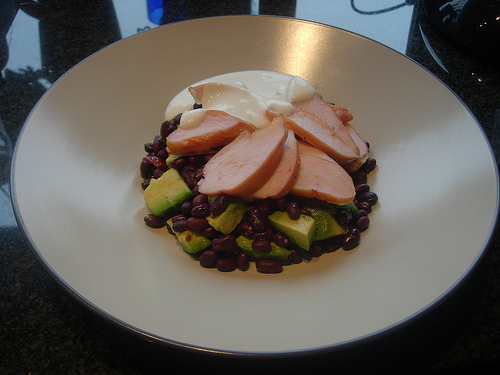 13:40 Lunch: Smoked chicken breast, avocado, black beans and sun-dried tomatoes with a lime and quark sauce. 17:00 I walked to the train (2,58 km) and took a train to the airport where my husband picked me up by car. We drove to Amsterdam for dinner and a movie, this was the first time in two years that we did a dinner and a movie. Usually we do one or the other when we go on dates. 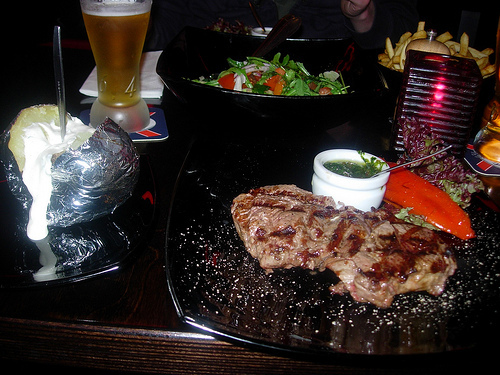 19:20 Dinner at a steak house in Amsterdam. I had fillet of beef with a baked potato and a side salad. 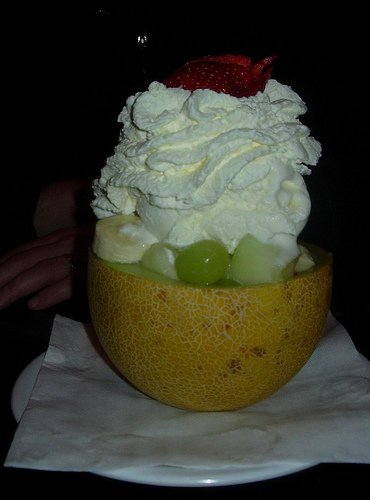 For dessert we shared a fruit filled honeydew melon with coconut ice cream and whipped cream. After dinner we went to see “the Tourist”. I liked the movie, Johnny Depp was a bit chubby, but I still thought he looked attractive. Angelina Jolie looked a bit old and very hungry, like she has been starving for years to keep that thin body. This entry was posted in food, life, movies and tagged 6.5 hours of sleep, airport, Angelina Jolie, apple juice, attractive, avocado, baked potato, banana, black beans, breakfast, chubby, cinnamon, coconut ice cream, corn flakes, cup of tea, cycle, date, daughter, day off, dinner and a movie, errands, fillet of beef, friends, fruit, honeydew melon, hungry, Johnny Depp, lime, lunch, mother in law, old, overnight bag, packing, parents in law, phone, pick up, quark, sauce, school, smoked chicken breast, starving, sun-dried tomatoes, tea, the Tourist, thin body, train, train station, walk, whipped cream, yoghurt. Bookmark the permalink.